If you have anyone of the following jobs around your home or business we can, in most cases, give you an estimate over the phone. 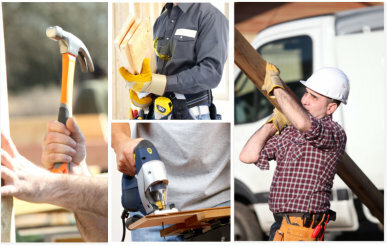 We are able to provide you this feature because of the many years of experience in home repair and construction trades. Please provide the following information about your job. We will make every effort to get back to you within 6 – 24 hours with an estimate. Please refer to our FAQ page for additional information about our business and work process. Uploading one or more digital pictures will greatly aid in providing an accurate estimate. Step 3. You will be contacted over the phone to discuss any further information about your job. Based on the job scope you might receive an estimate over the phone. There are some situations where an on-site visit will be necessary. Fill out the form below describing your job. Please reduce the image size. Only upload jpg, png or gif images. Thank you. * Please note that the job estimate can change based on additional requirements or unforeseen circumstance during the work itself. We serve the Northwest Quadrant of metro Atlanta Georga including Kennesaw, Acworth, Marietta , Powder Springs, Woodstock , Roswell, including all of Cobb County. Call 770-617-0668 and talk to Rich about your project. My window is broken, what should I do?